Holiday-Apartment in Swiss chalet, in the valley of waterfalls. Excellent location. Everything within easy reach. Very well kept and comfortable stay!! Heidi and Adolfo give excellent recommendation on activities around!! Great trip very nice area. Taveling to and from the property was convenient. The apartment was clean and comfortable . The owners were pleasant and helpful. This was my second trip to the region and assume it will not be my last!! Quiet space with adequate kitchen facilities, a spacious living area, and adequate bedrooms and bath. Easily accessible by the Post Bus from Lauterbrunnen. Visited in January--so beautiful w/snow. Went to dairy nearby twice to purchase fresh milk and got to see the cows in person! Heidi was very considerate and kind to work with. The owners are friendly, helpful and uphold the standards of Swiss cleanliness. The apartment is close to a bus stop and is an easy walk to waterfalls and a cable car. Public transportation is convenient and on schedule. Directly across the street is a dairy farm which serves fresh milk. The campground store is a few minutes walk. Deer graze in the pastures nearby. The location is very quiet and relaxing. My husband enjoyed watching the geese and chickens in the nearby fenced yard. Look out any window for a view of the mountains. We highly recommend staying at this apartment. We loved everything about this rental home. It was very comfortable for couples and the hosts were lovely. I really don’t think you could choose a better location. It was near Lauterbrunnen, Gimmelwald, Mürren, Grindelwald and Kandersteg. A fantastic experience! Supermarket was 5 min by car. Beds were comfortable and house was spotlessly clean. My daughter and I stayed in this beautiful chalet for five days and wished we had stayed longer. We had the entire downstairs which was more than enough room. It was charming and very clean. The views from our windows were spectacular. The location is perfect. We walked to Trummelbach falls as well as to the gondola that takes you to Murren and Gimmelwald. We had so many beautiful hikes and walks just by stepping out our front door. We will definitely be coming back again. We had the most amazing time. 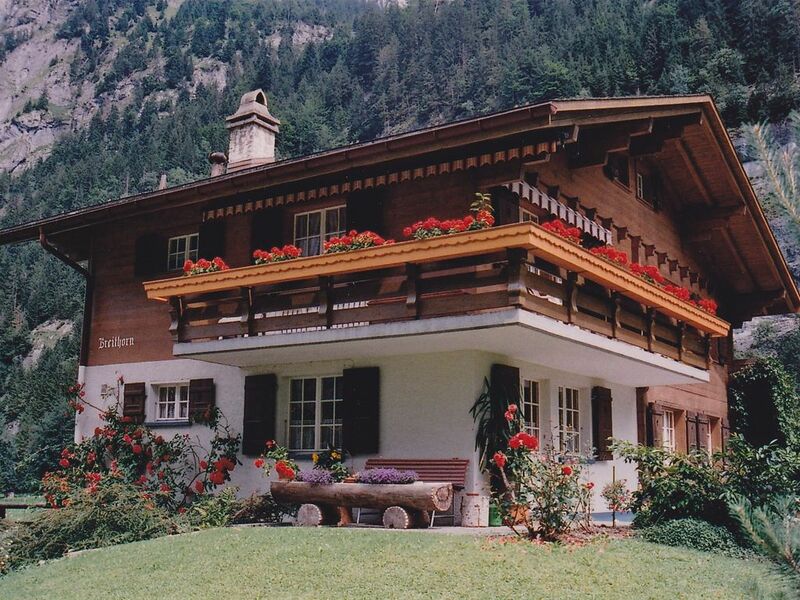 This chalet apartment is set in the beautiful quiet location of the Lauterbrunnen valley. In summer it is famous for its amazing waterfalls, spectacular mountain views, hiking, biking and mountaineering are popular summer activities, for the adrenalin seeker canyoning and skydiving are a must. In winter it is a wonderful ski resort with numerous ski lifts and cable cars. The area is known most famously for its downhill ski race in Wengen, every January. This picturesque mountain valley has the well known Eiger, Mönch and Jungfrau region on one side and the Schlithorn region on the other side. Both skiers and snowboarders will be delighted. The wildlife in this area is second to none, you will see daily chamois, deers and falcons, prepare to be amazed! If you wish to see more of our chalet look on our home page, ask us for link. visitor's tax is not inclouded!